We have an excellent new little line in our promotional Cotton Carrier Bags With Logo. They come in six splendid colours: Natural, white, navy, yellow, red and black. 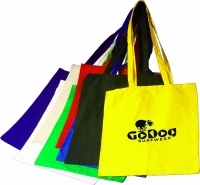 So advertise your business details and company logo onto our Cotton Carrier Bags With Logo and stay advertised! To find out more about our Cotton Carrier Bags With Logo click here and fill in the contact form and we'll get straight back to you. Other promotional and personalised items besides our Cotton Carrier Bags With Logo click here.